Here at CBC we take pride in our work, all of our kids beds are made to order via our onsite manufacturing facility based in the North West of England. Our team, are certainly one of a kind many of our craftsmen have been working with us for over 30 years. This means that over time we have developed and improved our range to create beds that stand the test of time, and rigours of everyday family life. Thanks to our experienced craftsmen our childrens beds and furniture is solid, and is made with great care and pride. Our company certainly wouldn't be where it is today if it wasn't thanks to our #BrilliantBedMakers. Over the next couple of months we wanted to focus on just what makes our company great, and how quality products such as our beds reach our customers in the standard that we have always provided. We want to introduce our customers to our first spotlight team member Barry, who is a real drawer and assembling connoisseur. 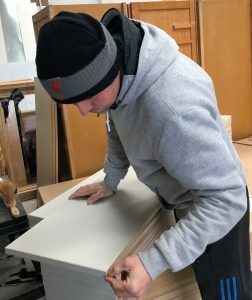 As a key team member Barry helps in all aspects of manufacture, from making the drawer units for beds, to installing furniture for our customers. Barry has been working in our manufacturing facility for over 21 years, which means he definitely knows a thing or 2 about furniture making. When he's not making furniture you can find Barry enjoying time with his family or watching Boxing. As well as Barry's love of furniture making, he also loves cheescake, and singing along to his favourite Elvis song, "if I can dream"
Get to know more of our brilliant bed makers next month, with our next spotlight team member.